Last week when we were in NY, we took a break from walking in the park, and tucked into a little café near Columbus Circle. My husband, who usually balks at kale, was surprised at how “edible” the miso Caesar baby kale salad I ordered was. Back home, we decided to make a baby kale Caesar on our own. 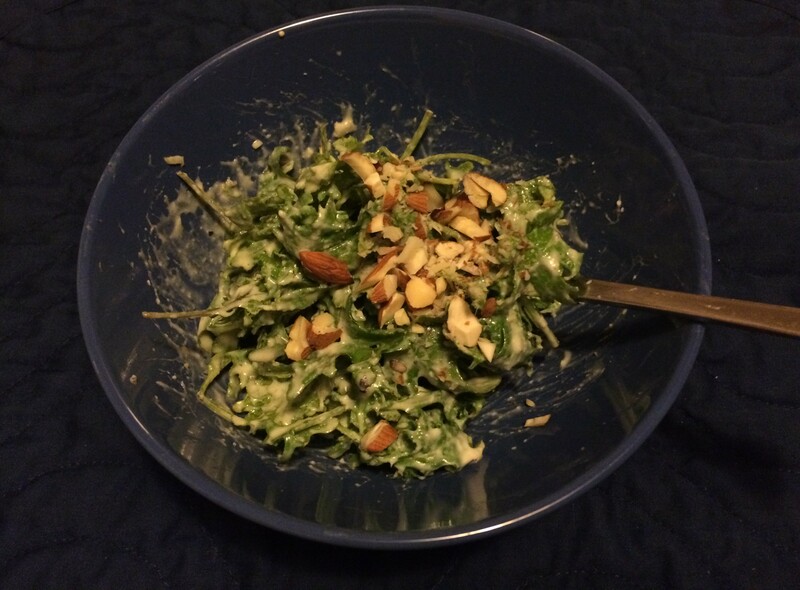 I am vegetarian, so finding a Caesar salad dressing is a challenge (they usually involve anchovies). I am also a bit leery about consuming raw egg, and am ambivalent about mayonnaise. This vegetarian Caesar salad dressing–with no egg or even mayonnaise–adopted from The Perfect Pantry, fit the bill. 1. Combine ingredients in a small bowl. (Update: If you prepare the dressing in a jar, you can keep it in the fridge and just pour it over a single serving of baby kale whenever you want a ridiculously easy, quick, and healthy snack or lunch). 2. Pour over baby kale (the recipe recommends ~ 6 c., but we have been using less – you can adjust the ratio to your liking). 3. Sprinkle with chopped almonds or hazelnuts (topping with a sliced avocado or fried tofu matchsticks will turn this salad into a full meal).